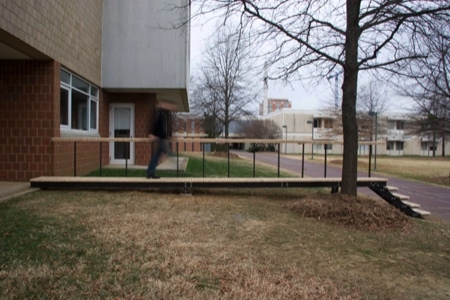 Executed in the Fall of 2006, this project was build to serve as an elevated walkway for the “faculty entrance” at the UNCC College of Architecture. As the second incarnation of this programmatic element this installation addressed many of the issues in which its predecessor was unsuccessful. This iteration of the walkway had very few requirements; the bridge may only touch in two points, must have twenty-four inch walkway and be constructed in an efficient and the framework should be reusable. The students, who themselves are regular users, were aware of the critical factors, were guided to take on a design process both based on and critical of the previous design. Through site analysis and previous experience the placement and structural system of the bridge began to take shape. Utilizing a wireless motion capture suit, the students analyzed the movement of the human body and generated a gestural form to be a screen for the walkway. The suit allowed the pursuit of multiple design iterations in a very short amount of time by almost instantly generating precise geometric representations of the captured movement. While this form became to design generator it was later removed due to feasibility and budget restrictions. router a stacked plywood decking system was designed to address spanning concerns and the lack of traction that had been one of the main criticisms of this projects predecessor. This project, conceptualized, designed and detailed in four weeks, was constructed in only nine days. The total budget for the project was fifteen hundred dollars. This was quite an undertaking for a seminar course and was only possible through an extraordinary effort from the students.